The other day, my neighbor called and told me he had sliced off the tip of his finger (yes, it was as disgusting as you would imagine) and asked if I could drive him to the E.R. I grabbed my bag and ran out the door . . . and, in my rush, I neglected to bring my iPad or a library book. Sitting in the waiting room, I realized very soon that all I had with me was my cell phone. After checking Facebook and Insta and various “news” sites and playing random games on my phone, I grew very bored and very restless, very quickly. I was in the middle of two “real” books at home, so I didn’t want to start something new . . . but I had nothing else to do. 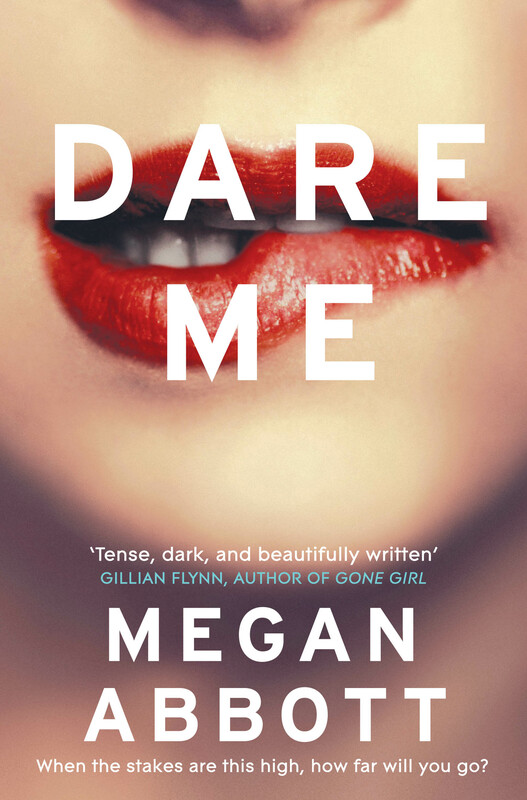 So, I scrolled through my unread Kindle books and happened upon Dare Me . I purchased this e-book when it first came out a couple years ago but never got around to reading it. The cover and blurb suggest trashy beach fluff . . . but it was named an Amazon Best Book of the Month for August 2012. So, I bought it hoping for trashy beach fluff that was actually decently good. As it turns out, the Bring It On and Hit the Floor comparisons are not entirely without merit. Like Bring It On, the book is filled with clueless and catty high-school cheerleaders who think cheerleading is EVERYTHING. They will stop at nothing to be the best of the best (including bringing others down, starving themselves, and being generally awful human beings). Like Hit the Floor, there is a Jelena-esque mean girl (Beth) who will do any manner of horrible things to remain captain of the team and leader of the girls. And there is an underlying mysterious death (suicide? murder?) around which the plot revolves. Unfortunately, it’s not as campy as Bring It On nor as evil as Hit the Floor. It’s just middle of the road. With Dare Me, I wasn’t expecting anything deep or profound or enlightening. I was just hoping for a little bit of evil and a little bit of camp. I wanted suspense and excitement! Unfortunately, it couldn’t even live up to those expectations. At the beginning, the writing style is fun, the characters are delightfully deplorable, and the pace is fairly quick, but, around the halfway point, it really starts to fizzle. Abbott created a fantastically awful character in Beth, but she didn’t end up using her to her full potential. Beth could have done so many more deliciously terrible things! Similarly, the mystery (Addy’s efforts to uncover the truth about the suicide) isn’t nearly as suspenseful and exciting as it could have been. In fact, it’s kind of boring and draggy and serves to distract from the book’s strength: its vicious characters. The book would have been better if Abbott had focused on the cheerleaders’ day-to-day evils. Those criticisms aside, I have to admit that I was surprised by some of the turns of events (that is to say, the mystery wasn’t entirely predictable), and the book kept my interest enough to keep me reading late into the night to find out what happened in the end. Plus, it reads very quickly (I breezed through almost half of it on my iPhone in the E.R. waiting room). Final assessment: Dare Me definitely wouldn’t be a terrible choice if you’re looking for a mindless, girly thriller to read at the pool. But, if you’re just sitting at home with a couple hours to kill, you may just want to watch Bring It On or Hit the Floor instead. Who should read it: Brandee (i.e., fans of deliciously trashy television shows like Hit the Floor). And, if you liked Gone Girl , this should be up your alley. One final note: My neighbor is fine. Turns out, if you slice the tip of your finger off, you’re out of luck. They’ll wrap your finger up and give you a prescription for the pain . . . but you can kiss that fingertip goodbye. This entry was posted in Rating: 2.5/5 and tagged Book review, Book Reviews, Books, Bring It On, Cheerleading, Dare Me, Hit the Floor, Megan Abbott. Bookmark the permalink.